Seeing old friends during the holiday season always seems to encourage some reflecting. One thing that I personally thought about were the friends that no longer live close to me anymore. This past year, I made my usual pilgrimage to Hoboken, New Jersey where they moved to. Which is great because I get to stay near Manhattan with great pals, who could ask for more? I have been visiting the New York City area on a fairly regular basis since 1989 and have done many things there. For instance, I have been to the cupcake place, the Strand, MOMA, the obligatory Broadway shows and all the usual touristy haunts from the start, or so I thought. 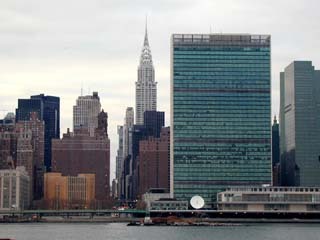 What I did forget to do was the U.N. building. How could I have been so blind as to miss one of the most important touristy things to do in NYC?!?! I was ashamed. Mortified. Taken aback, even! After walking the Brooklyn Bridge (yes, I did not do that before, either) and right before getting a margarita at the pier (yes, I HAVE done that before), I urged my hosts to get me to the U.N., and found out that even they have not been there either. I felt I had done my little part to get us more educated. Then I wondered, when I saw the huge building and walked inside to see the many conference and meeting rooms, "Why haven't I ever wanted to see this before?" Not only is the U.N. one of the most important institutions in the world, but you get to see all sorts of cultures represented by their art, flags and photographs throughout its halls and rooms. If you get a chance to do so, get thee to the U.N.! You'll be amazed!! Oh, and the scenery from behind the building is just as spectacular! 800-CEO-READ is doing more and more business internationally. This is not a new trend for us. In fact, we've shipped to places in Australia, Africa and so on since we first delved into the business book world.